What is FITS? Well, you take nearly 70 speakers from around the world – twenty countries to be exact – all of them vocal advocates of sustainable tourism-, gather them in a large room in South Tunisia surrounded by Berber arts and crafts, and there you have it: one of the most diverse and dynamic forums for sustainable tourism the industry has to offer. Perhaps the most thrilling moment for us at Gender Responsible Tourism and Equality in Tourism was when Iaia Pedemonte and Manuela Bolchini publicly announced the launch of a new network to lobby for the creation of a global standardised gender equality label for the tourism industry. 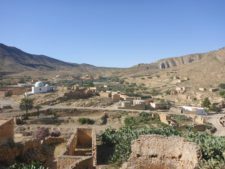 The response to this initiative, (the origin of which lies in a speech given by ZIneb Boutkhoum, the first female Moroccan Berber guide, at the 2016 Responsible Tourism Day in Morocco), was overwhelming. After discussions among attendees and stakeholder organisations, it was embraced by OITS, AITR, the Moroccan and Tunisian tourism ministries, Regione Liguria in Italy, Village du Monde, Cenesta and others. After initial scoping of support, Iaia Pedemonte and Manuela Bolchini from Gender Responsible Tourism will in the following few weeks be circulating a first draft proposal. If you want to learn more about this initiative, or support the development of a new gender equality label for the international tourism industry, then please contact our friends at GRT at info@g-r-t.org.